​A hurricane is a tropical cyclone with sustained winds of 74 miles per hour or more. Hurricane winds blow in a large spiral around a relatively calm center known as the “eye.” Hurricanes bring torrential rains, high winds, floods, and storm surges as they near land. ​Hurricanes can be dangerous killers. Most hurricane-related deaths are caused by floods. It is important to learn what to do if a hurricane is coming. To learn about the hurricane risk in your community and your community’s preparedness plan, contact your local emergency management office or American Red Cross chapter​. Get a week’s supply of food and water to be kept at home (in addition to the three-day supply in your Disaster Supplies Kit). Install protection to windows, glass sliding doors and garage doors. Follow flood preparedness precautions if you live in an area prone to flooding. Have an engineer check your home and tell you how to make it more resistant to wind. The National Weather Service issues a hurricane watch when there is a threat of hurricane conditions within 24-36 hours. A hurricane warning is issued when hurricane conditions are expected in 24 hours or less. It is important to follow the directions of local law enforcement and government officials. If you are told to evacuate, please leave the area according to the instructions provided. Listen to a National Oceanic and Atmospheric Administration (NOAA) Weather Radio, a portable battery-powered radio (or television), or a smart phone for updated emergency information of watches issued in your area. Hurricanes can change direction, speed and intensity very suddenly, so stay updated. Check your Disaster Supplies Kit and get any missing items if possible. Bring in outdoor objects such as lawn furniture, toys and hanging plants. Remove any weak branches from trees and shrubs. Close and board up windows and glass sliding doors. Permanent shutters are the best protection. A lower-cost approach is to put up plywood panels. Turn off propane tanks. Turn off utilities if told to do so by authorities. Store valuables and important documents in a safe deposit box or on the highest level of your home. Choose two places to meet if your family becomes separated. Decide where you would go and what route you would take to get there. Bring your Disaster Supplies Kit. Keep a phone list of emergency contacts. Evacuate if told to do so. If in a mobile home, check tie-downs and leave immediately. 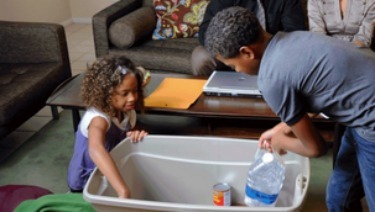 Take your Disaster Supplies Kit and disaster supplies and go to a shelter or your family’s contact home. Call your out-of-town contact so someone will know where you are going. Have a supply of flashlights and extra batteries handy. Use flashlights instead of candles or kerosene lamps. Store drinking water in clean bathtubs, sinks and plastic bottles. If power is lost, unplug major appliances to reduce the power surge when electricity is restored. Don’t be fooled by the calm “eye” of the storm. The worst part will happen once the eye passes over and the winds blow from the opposite direction. Be alert for flooding. If driving and you come upon a flooded road, turn around and go another way. If caught on a flooded road and the water is rising, get out of your vehicle and seek higher ground. Continue listening to local radio or television stations or a NOAA Weather Radio for updated information and instructions​. If you evacuated, return home only after local officials tell you it is safe. Help those who may need special assistance and give first aid where appropriate. Stay on firm ground and avoid areas where there is debris or it is generally unsafe. Enter your home or any building with caution. Children should only return when adults say it is ​safe to go home. Wear sturdy shoes and do not enter if there is water around the building. Use flashlights to examine walls, floors, doors, staircases and windows. Inspect foundations for cracks and make sure the building is not in danger of collapsing. Look for fire hazards such as flooded electrical circuits or submerged furnaces and appliances. Check for gas leaks. If you smell gas or hear a hissing noise, open a window and leave quickly. Turn off the gas at the outside main valve and call the gas company from a neighbor’s home. Look for electrical system damage. If you see sparks or frayed wires, turn off the electricity at the main fuse box or circuit breaker. If you have to step in water to get to the fuse box or circuit breaker, call an electrician first for advice. Check for sewage and water line damage. If you think sewage lines are damaged, don’t use toilets and call a plumber. If water pipes are damaged, don’t use tap water and call the water company. Watch out for animals, especially poisonous snakes that may have entered the building with flood waters. Take pictures of the damage for insurance claims. Avoid drinking or preparing food with tap water until local officials tell you it is not contaminated. NHC Hurricane Preparedness Videos​ (U.S. National Weather Service​) - NHC Senior Hurricane Specialist Stacy Stewart discusses the life-saving action to take before, during and after the storm.